Bariatric Girl » Blog Archive » Dr. Oz did a positive weight loss surgery show!!!! Next Article« Did Paula Deen have weight loss surgery? Dr. Oz did a positive weight loss surgery show!!!! Please don’t pinch me and wake me up! Yesterday history was made when Dr. Oz did a positive show on gastric bypass surgery. Lap banders he did a show for you a few months ago and I posted about that here. Of course I expected the very vocal anti-surgery types but I was a little surprised at how many pro-surgery people picked it apart. I had to remind myself that many post-ops are fairly new and don’t remember the years of abuse we have suffered from other talk show hosts. I’ve blogged many times about Oprah and even Dr. Phil who is kind of half and half on the subject (one of his nephews had the surgery). I’ve blogged about People magazine that won’t include us in “women half their size” because they say “no surgery, no gimmicks”. I’ve offered articles about great weight loss stories to many magazines but they don’t want weight loss surgery content. The list is endless. The stigma is alive and well. When I read the description of the show I thought it was a trick. It was called The most under performed surgery you should be getting. A Dr. Oz special report on how to lose weight instantly, prevent heart disease, cancer and even reverse diabetes overnight with a surgical procedure. After reading it about ten times and peeling myself off the floor I was jazzed. Dr. Oz usually has a pro and con professional but this time he only had positive professionals. The only post-ops were one woman who was four years out and had done well and another who was ten years out that hadn’t. The woman that hadn’t done well had three children after surgery and said she gained with each pregnancy. I’d say that’s pretty common under any circumstances. More power to post-op women after pregnancy who keep the weight off because I’m not sure how well I would have done. Let’s remember that just because he didn’t cover other surgeries, cross addiction, and the many other possibilities that it’s at least a beginning. He did cover lifestyle changes and vitamins. Instead of complaining about the show why don’t you write Dr. Oz and ask for specific subjects to be covered? I’m very close to many people in AA and one of my favorite sayings about addicts is “you could ask one of us to a birthday party the wrong way”. That translates to no matter what is said someone will find fault in it. This surgery basically cures diabetes and we will be paying for years treating the disease instead of stopping it or at least slowing it down. We all know post-ops that have had various levels of complications but they are in the minority and most of the post-ops I talk to say they would do it all over again. Having the surgery is a personal choice and I’m tired of being criticized for taking the easy way out. I’m healthy for the first time in my life and it shouldn’t matter how I did it as long as I didn’t damage myself. I am just proud that Dr. OZ took the initiative to bring the subject to the public eye. Because of the stigma that comes with obesity, it is hard for people to adjust to the fact that it is just as much of an illness as alcoholism. I had bariatric surgery 6.5 months ago, and have lost over 65 pounds. I have never felt this healthy in my entire life! I am over 50 and feel like 30 again! I would love to tell you all of the amazing things that have improved in my health and condition. I went from nearly disabled to running and kickboxing today. My goal is to lose weight, and stay in shape on the way down so when I reach my goal, I will be healthy as ever, and not require plastic surgery to put my body back in the shape it should have been in all my life. I was not fortunate enough to have good genetics, and have had a battle all my life…….but now……I have the greatest tool in the world…….the gastric sleeve!! I now have hope….I now have LIFE!! 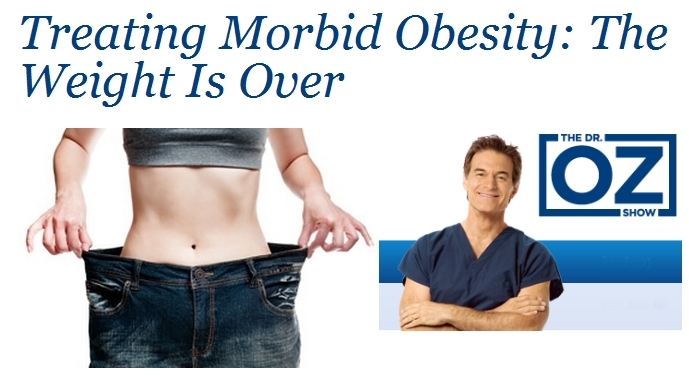 Thank you Dr. Oz for showing the world that obesity isnt always a choice, and bariatric surgery isnt a magic bullet, but it can be a great tool in eliminating many other co-morbidities that come along with being over weight. Think of the medical costs that could be saved if people were able to get healthy! Some insurance companies have seen the light…….some have not! I wish entire medical provider community will share the real cure to obesity instead of treating the symptoms, and the people will accept bariatric surgery as the CURE and become a more healthy America! You are correct about it being a disease. Do you know that alcoholism was not considered a disease until 1956? It takes time for people to learn and understand and it is definitely happening. I’m really happy for you and most of all I appreciate you seeing the greatness of this show even though it wasn’t about your particular surgery. I think we are all in this together and we need to stop that stigma associated with all kinds of weight loss surgery. Thank you so much for taking the time to tell me your story and I’m so glad you got a second chance in life too! Commented on 01/27/2012 at 15:39 by CYNTHIA B. Thank you BG for posting your inspirational message. I have been considering bariatric surgery now for some time, and have finally taken the proactive steps to making it a reality. I attended an information session at my local hospital and have scoured the internet looking at support groups and reading other people’s stories. After having battled weight issues for over 20 years, it is time to take the plunge. I am currently 5’6″ and 283 pounds. I’ve been on high blood pressure meds for about 2 years now, and although I am not diabetic, it runs in my family, and I don’t want to go down that road….so I am ready! Your story is so moving. Thanks again. Cynthia I am so pleased for you! I was also going to be diabetic because it was very common in my larger family members (well most of them were large). I was on high blood pressure meds too and had sleep apnea and was done with both of them in no time much less the obvious improvements that losing 130 pounds did for me. At the bottom of my blog there is a link to my Bariatric Girl facebook page and I’d love to have you there. You can ask anything you wish and no question is dumb. If you are concerned about sharing this information via facebook many weight loss surgery people create another account with a “weight related” name so their friends aren’t overwhelmed with the comments and support groups that deal with only this subject matter. Thank you for commenting…it makes me happy knowing the possibilities in store for you! Commented on 02/26/2012 at 20:22 by Marcia M.
I’d love to know if you think I should have the lapband. I am a female, 68, only 4’10” and weight 165. My BMI is just around 35. I’m breathless, tired, live on caffeine, am Type II diabetic and have obstructive sleep apnea. I have to sleep with a CPAP and my face is getting imprinted with the mask. Aside from the obvious health issues, I am a nice looking woman who cannot find clothing. I’m going back to work in a profession where I must look successful. I am getting scared to death and don’t know if I should look for the lapband (I’ve been approved) or look for the new plication surgery (sleeve?). I’m afraid to be throwing up with the lapband, slippage, etc. I think the plication actually removes the ghrelin (spelling?) hormon-producing cells in the lining of the stomach that send signals to the brain to eat. I am sick and tired of NEEDING chocolate and carbs. You seem very successful and I’d take your advice to heart. Look forward to your answer. Thank you! Marcia first of all I am so glad you’ve been approved! I so get everything you described and it is no fun. I try to stay out of the “which surgery to get” business but I do encourage you to visit a doctor that offers all of the choices available. If you go to a physician that only offers one kind of surgery you only get that choice. Mine was so long ago that I only had one choice (which was gastric bypass) but I believe with all my heart that I would have made any surgery work because I just couldn’t live like I was anymore. You certainly seem like you’ve done your research and I’m glad. I’m going to email you personally and ask some questions. Thanks so much for posting. I so hope you’ll get the gift of surgery. It saved my life…and it will save yours too. THE LIFE YOU SAVE WILL BE YOUR OWN. ALSO YOUR CHILDRENS PARENT. SURGERY SAVED MY LIFE MANY YRS AGO. Howdy very cool web site!! Man .. Beautiful .. Amazing .. I will bookmark your site and take the feeds additionally?I am glad to search out numerous helpful info here within the submit, we’d like work out extra techniques on this regard, thank you for sharing. . . . . .
Hello, I just stumbled across this website as im am researching information about a new gastric bypass option that is no suguery required, its called the mini gastric bypass by roca labs and a fraction of the cost however im wondering if anyone has heard of it and if its a suitabe option anyone have any thoughts on this? Courtney I am so sorry…I have no idea why I didn’t find your comment until just now. I have heard of it but it is not a real “mini gastric bypass”. There is no surgery involved and while that may seem like a plus…there’s a reasons why it only costs a few hundred dollars. There is an actual procedure called a “mini bypass” that one doctor in particular from Nevada does. I don’t know if you’ve pursued this any further but personally I can think of many reasons why it is not a long term solution and I don’t know a single person who has benefited. It is difficult to find very much real information because you will be sued if you post it. I hope that helps. hoping to start my own blog soon. Anyways, should you have any ideas or tips for new blog owners please share. Hello Yvonne, My Dr. stated that I qualified for bypass surgery my insurance company refused to pay for it. Like Courtney I found the website for the mini gastric bypass I was hoping to find something positive about the product I’m 49 and 190bls my bmi is 35 I have high bp and other health problems and in dier need of help and my enegry level is zero. what I’m looking for is a good jump start ……please help!!!!!! I am going to send you email about this one because this company will sue for libel if I were to say anything negative. I’m trying to find more info on this product. I went to roca labs site but in order to get approved I have to give my credit card info and wasn’t to comfortable with that. Is there any where I can get more info or is there certain clinics for this?? Thank you in advance. I don’t know how I missed your post but I sent you a message privately. Roca Labs and gastric bypass have nothing in common. Gastric bypass is weight loss surgery and the other is something you drink to feel full. This is all great information regarding weight loss surgery and the risks associated. Also important is learning about whether or not you are a qualified candidate for the surgery. At Pacific Bariatric, we conduct free seminars for you to attend and ask questions. Our physicians are also onsite. Contact us for further information about these seminars to locate one near you. I am so glad I found your site. I am in dire need of support as I am about to have gastric bypass surgery and I’m starting to wonder if I am making the right decision. I’m 58 years old 5’5″ and weigh 244 bls. Some of my family supports me some do not. My 86 year old mother at first acted like she would support me however I have since discovered that she is telling everyone else in the family that she doens’t want me to go through with it. I have type 2 diabetes, hbp, osterarthritis, glaucoma and thyroid nodules. I know in my brain that I need to do this but I am getting scared about complications and whether or not I will be able to keep the weight off. One of the other things that is really bothering me is that I suffer from depression. Not debilitating but it gets bad sometimes. I wonder if that will affect my success. Oh and I forgot to mention that I have had both a hip and knee replacement since 2008. I know I need to do this but I feel as though I have no one to talk to about it. When I bring it up with two of my daughters they get quiet and sort of zone out. There are support groups for post-surgery but I need one for now. I have a 6 month process to complete before I can have the surgery. I have attended 4 of the 6 nutrition classes that I need and on Friday I have to have a colonoscopy and EGD. I also have to go to a cardiologist, pulmonologist and have a sleep study done! And on October first I have to meet with a nurse practitioner and then for three weeks I have to attend life classes. This is all required by my insurance company or they will not pay. I guess I should be grateful that they are so thorough. I must be committed if I am going through all of this but it is so overwhelming at times and I am still starting to have second thoughts. Any advice or encouragement would be greatly welcomed. Gayle I don’t know how I missed your comment. I will email you directly to make sure you see my answer! later in life. I want to encourage one to continue your great job, have a nice afternoon! Has anyone heard of Roca Labs mini gastric sleeve without surgery? Also if know anyone that used this type of product? I will write you an email just like the other lady that asked about this product. I was researching mini gastric bypass by roca labs and no positve reviews. Will you be able to give me more information about mini gastric bypass that dr in Nevada does? I am 5, 7 and 224 lbs with bmi of 35 i hoping I will qualify for it. This is very tricky. The mini gastric bypass done in Nevada is an actual operation. Mini doesn’t necessarily mean less money. I will write you a personal email to explain the difference. If I talk about the one by Roca Labs I can be sued even though I’ve never signed anything nor tried it. I will email you!